If you’re an average NBA fan you probably don’t have a clue who John Hollinger is. You probably haven’t ever seen his Power Rankings on ESPN.com either. Rest assured, you’re not missing much. It’s flawed at its core for one reason: it’s completely objective. In everyday conversations, most people would probably say that being completely objective is a good thing. But the reality is that a little bit of subjectivity is actually essential. In sports this is especially true. There’s only one stat in sports where being completely objective works: wins (unless you’re talking about NCAA Division I Football, in which wins become subjective). The beauty of sports championships is that you can’t argue who the best team is once the season is over. Whoever won the title is best. Period. Even if that championship team hit a late hot streak and someone tries to say that “the best team didn’t win,” it doesn’t matter. A win is a win and a championship is a championship. There is no award for a team who was actually better than the team that won. What Hollinger has done is created a ranking system in which the rank of a team isn’t affected at all by its wins. It’s not even factored into the equation. The only stat that he cares about is scoring margin. Whichever team outscores its opponents the most moves up the rankings. If a team only squeaks by in its wins they move down. As I’ve blogged before, there is a problem with this system. It tricks up wins. The BCS has even dropped this stat from their ranking system, but Hollinger and ESPN are sticking with it. The reason there’s a big problem with using just this stat to determine the rank of a team, especially the way he has it set up, is that a team could go undefeated throughout the season and still be ranked last. Here’s why. This probably makes no sense, so let me explain. There are two things he has done. First, he’s weighted home wins as meaning less than road wins. How he was done this is by setting it up to where if the home team wins by three points or less that win actually would negatively impact their rank. Second, he’s weighted the most recent 25% of the season’s games at 1/3 of the total value. This second part makes sense, but the home performance factor is still there, so in a sense the least valuable thing a team can do to move up in the Power Rankings is win at home. The reason I’m pointing this out now is that the Mavericks are the best example of why this system is broken. 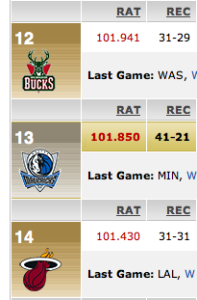 As of this writing, the Dallas Mavericks are ranked 13th in his Power Rankings. That’s right, 12 other teams are considered to be better than the Mavs, who have rattled off ten consecutive wins (the tenth win hasn’t been factored in yet, though, since the rankings are updated each morning). Here are the teams currently ranked above Dallas. 1) Cavs; 2) Magic; 3) Lakers; 4) Jazz; 5) Suns; 6) Nuggets; 7) Hawks; 8) Spurs; 9) Thunder; 10) Celtics; 11) Trail Blazers; and 12) Bucks. I don’t really have an issue with the top 4 being ahead of the Mavs, but the Bucks…really? Also, didn’t the Mavs just beat a lot of these teams in the past month? (They did). I’m not going to make a case yet that the Mavs are true title contenders this year, but I do know that they’re not near the bottom half of the league in regards to how good they are. After all, they do have the fourth best record in the league. But with Hollinger, wins don’t really matter that much. What do you think about his rankings? Basketball goal image by flickr user Baffle. I totally agree and we have been on the same note about Hollinger’s Awful Rating system for years…I like the win is a win and a championship is a championship argument, sometimes the best team does not always win…we know this all too well ala 2006. Great minds think alike. I agree that the “best” team didn’t win in 2006, but we can’t call them the best because they didn’t win. I still cringe a little every time I see a D-Wade commercial. I like the point differential and the heavier weight on Away games, but record SHOULD be factored in the equation. A win is a win. 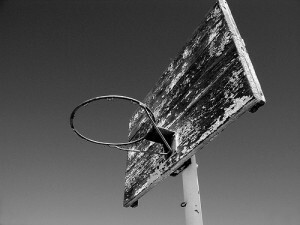 It doesn’t matter how dirty or the close the game is in the end. The final 6 minutes or quarter of a game is when you separate the men from the boys. I think how a team consistently or inconsistently closes out games should play a MAJOR factor in power rankings. Yeah, I really don’t know why there’s no value for wins in his equation. Seems like that should be at least part of it. It also does not take into account that clearing the bench when winning by large margins would likely lower your margin of victory. There by lowering your power ranking. I definitely see flaws in his formula. Or what about a team like the mavs who have 4 players battling injury but they still are winning. Their margin of victory could be much higher with all their players healthy. However they are still finding ways to win. “One of my goals was to create a system that told us more about a team’s quality than the standings do. So instead of winning percentage, these rankings use points scored and points allowed, which are better indicators of a team’s quality than wins and losses. This might not sound right at first, but studies have shown scoring margin to be a better predictor of future success than a team’s win-loss record. Thus, scoring margin is a more accurate sign of a team’s quality. I agree with all the points made and so really have nothing to add. I just wanted to add a comment so that Kevin would feel good about himself today. Way to go Kevin on a well written blog post! Hollinger has this to say about his rankings….so instead of winning percentage, these rankings use points scored and points allowed, which are better indicators of a team’s quality than wins and losses. That explains why, for instance, three seasons ago the Spurs ranked ahead of the Mavericks even though they had won nine fewer games — San Antonio’s scoring margin was superior. That ultimately proved to be prophetic, as Dallas lost in the first round of the playoffs while the Spurs won the championship. Yep. It did work out pretty well for him that time. Unfortunately his past rankings seem to be hidden from the public, so we can’t really see how the rest of the ranks work out. gee aren’t you going to post Hollinger’s words about his own rankings and PROOF that they actually work and you are a dummy???? “So instead of winning percentage, these rankings use points scored and points allowed, which are better indicators of a team’s quality than wins and losses. When you submit a comment you should see a notice like “Your comment has been submitted and is awaiting moderation” or something like that. Believe it or not I actually try to sleep during the night. I think his rankings to a great deal to show which team is playing the best basketball. That’s all he really claims. Winning marginally at home doesn’t mean that you’re playing the best basketball. Since winning percentage only shows us one of two eventualities – that a team won or lost – then it tells us little about HOW the team performed. His team ratings peer deeper into the equation to capture something that winning percentage cannot. This is a valuable tool in evaluating performance. To say that it is flawed is really missing the point. Then, since I’m commenting in retrospect, look at how the Mavs performed in the 2010 playoffs compared to the teams ranked ahead of them in this mid-season snapshot of Hollinger’s rankings. I think you can see that his objective rankings at the time did more to tell us about the quality of the Mavs than your subjective opinion. I definitely have a subjective (or a Mavs homer), but the Lakers and Celtics were bot NOT in the top 10 and they were in the Finals. That’s as much of a condemnation as anything. –Not true. With factors accounting for strength of schedule, etc, a win counts +1 and a loss -1 for scoring margin. So it’s definitely factored in. The difference is of course that if you win or lose by, for example, 10 points, that counts 10 times as much. I agree with you that the ability to win a close game should count for something – and in Hollinger’s system it does – but it is not singled out for extra weighting as you probably would like, and the point margin and strength of schedule (and other factors) count, whereas in the standings they are actually not even factored in. The standings, and Hollinger’s rankings, are both objective. I like his rankings better, because they simply provide more information than the standings do.